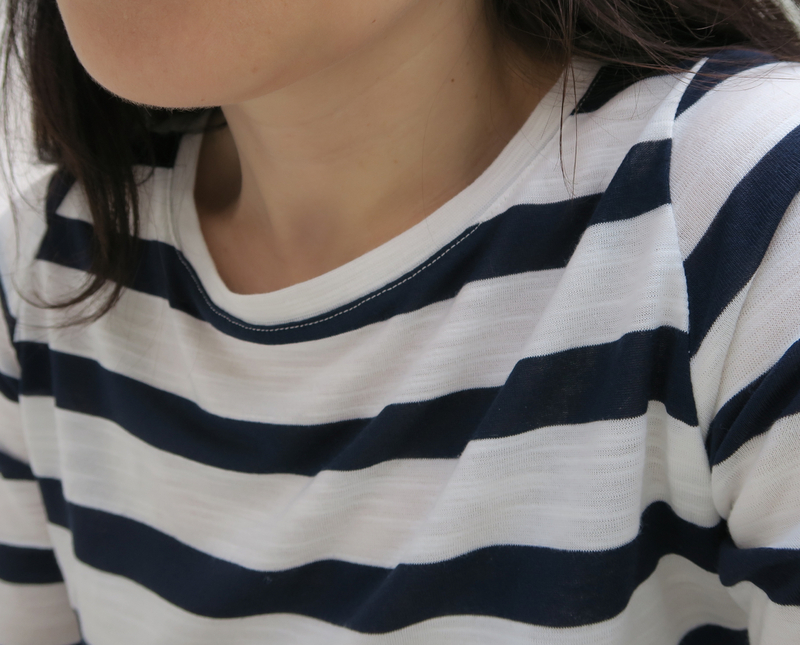 This is going to be an uncharacteristically quick post, due to it being the last day of the school term before the summer holidays begin, which means that time for work/blog posts/eating surreptitious chocolate brownies with my husband/sewing is rapidly dwindling. Today, I have a few things to share with you (well, in reality, just one of you, but I always find hope and anticipation can feel like a gift for the time that they last, so hopefully that makes the sharing more widespread!). I know that when I first began sewing with jersey, it almost felt like learning to sew from scratch again - so many different rules apply and I also found that so many previously unencountered tools, needles and tapes can help to make things easier. 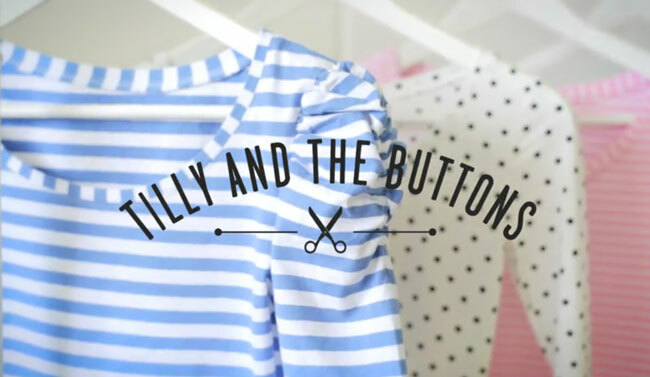 So, as well as the Agnes pattern, Tilly has also recently launched an online workshop and if you're new to sewing with stretch fabrics, teaming a specific pattern with a tailor made workshop would, I imagine, be the perfect way to launch yourself into jersey-land without the steep learning curve of trying to work everything out for yourself. Slowly. Ruined garment by ruined garment. As I did myself several years ago. So, Tilly has very generously offered both the Agnes pattern (printed or PDF, whichever you'd prefer), along with a place on the online workshop (to be used at any time, in your own home) to one of my readers, anywhere in the world! I think that equates to a value of around £56/$88USD, so it's a rather lovely giveaway. So, how to enter. Last weekend, I met Judy Blume, who wrote the backdrop to my (and nearly every other girl's of my generation) early teenage years with Superfudge, Are you there God? It's me, Margaret, Deenie, Tiger Eyes and, most famously, Forever. Judy Blume was in London at the Young Adults Literature Convention, in conversation with Patrick Ness. As I also love his books, it was a huge treat and Judy, now 77, sparkled and delighted the entire audience and my cheeks ached with smiling throughout their discussion. Afterwards, we had our books signed (my sister bought us both a copy of her latest book for adults, In the Unlikely Event) by Judy and continued in our ridiculous levels of delighted starstruck beaming. Aside from Judy Blume, between the ages of about eleven and thirteen I also loved Francine Pascal and Paula Danziger, authors who delivered papery slices of America, a place which seemed infinitely cooler than England (and seemed to have more summer camps, more fun, more proms, more boys, more romance and more of everything 'good' in it). These books discussed all manner of rites of passage that largely went un-talked-about in everyday life, but for as much as they clarified, they also confused, presenting cultural mysteries to be solved: like why didn't we have any 'ky-ha-kee pants'? It felt like we were missing out on a whole range of clothing as it was what every American girl seemed to put on before going off on a casual date. I later discovered how to properly pronounce the word 'khaki' and learnt that Americans call trousers 'pants' and was disappointed to realise it just meant sludge-green trousers, which I never would have worn; In Francine Pascal's book, 'Love, Betrayal and Hold the Mayo', with no internet to consult, my sister and I were left puzzling over what 'mayo' might refer to and why one would need to hold it, and it wasn't until our twenties when this term started appearing on English menus that it finally dawned on us that the book we'd read all those years ago was just curiously requesting 'no mayonnaise' in its title. Either way, these books ultimately left me with the idea that the world would be a much, much better place with a boyfriend in it and so I studiously kept one (although not the same one) by my side for much of my teenage years. It wasn't until hearing Judy Blume talking about censorship at the weekend (her books were banned in many libraries following Ronald Reagan's election), that I began to wonder how different those years would have been if my own choice of reading material had had a substantially different focus. I'd love to know which book or author made the biggest impression on you when you were growing up and perhaps maybe even contributed to the person you were at that time? And if you weren't much of a reader, was there a film that you remember loving? Ps. Tilly has just released two gorgeous new patterns (using woven fabric and unrelated to this giveaway). I'm really tempted to make a pair of these for my teenager. The other pattern is this one - perfect for a beginner as it has no darts or zip or button fastenings, but looks chic and minimal, rather than beginnerishly simplistic in finish! 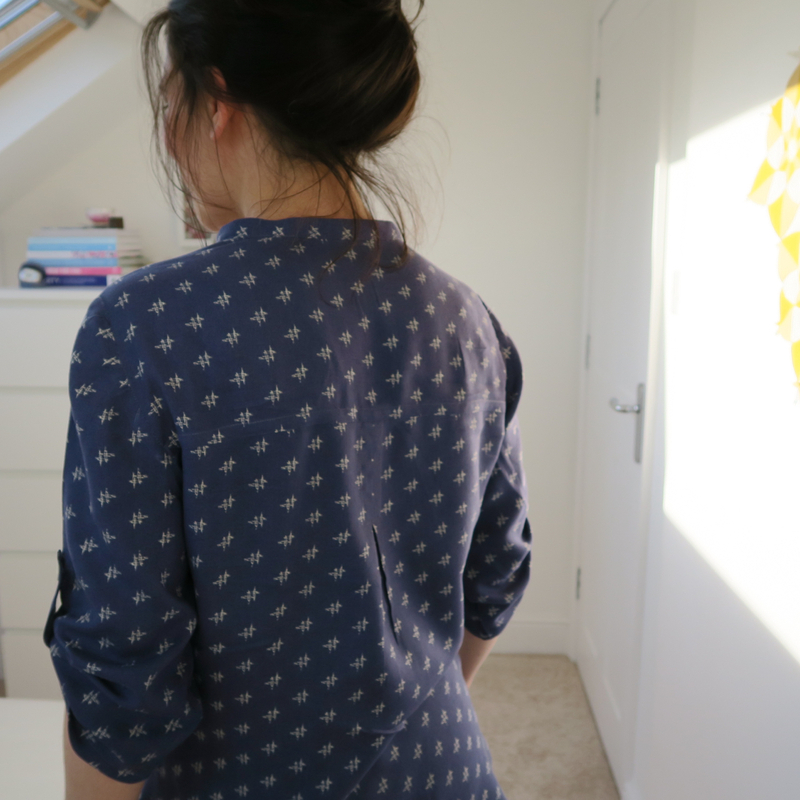 I think that I could happily make about twenty different versions of this top! I actually made this one well over a month ago, but I ended up sacrificing a few of the details that I had planned due to not having quite enough fabric - such as a full collar and rounded plackets - so I ended up posting about the subsequent version first, as it was closer to what I'd originally envisaged. The fabric I used for this first version was Heather Bailey's Momentum rayon, which is quite dreamy and has that rare quality of being opaque, but also being incredibly fine and drapey, without the special occasion delicacy of a crepe de Chine. It's perfect for everyday wear. I love it. 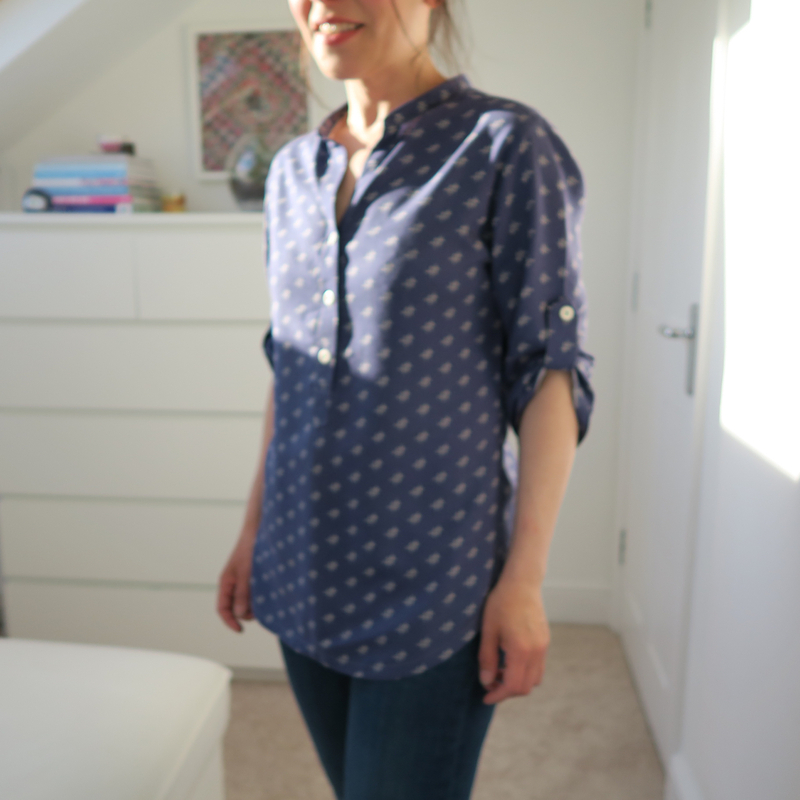 The only place I could find it in the UK was Clothkits and I bought their last 95cm (this top really is made from just 95cm - I barely had an inch left! ), but I've since realised that Fancy Moon also stock it. I love how wearable this print is - very much designed with dressmaking in mind, rather than quilting. 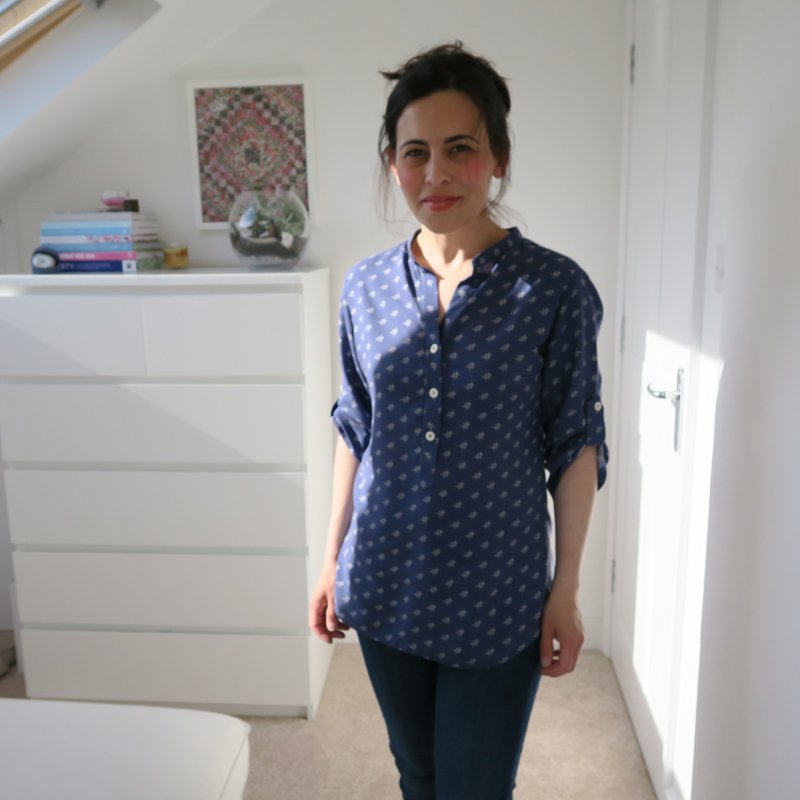 The blouse is self-drafted and I'm really happy with the fit. It's quite long, with a deeper hem at the back, as well as a box pleat at the back yoke (I'm not sure you can see it too well here!). This means that the blouse can be relatively fitted through the chest, but flare out with a little more room over the hips, to accommodate a naturally-occurring bustle (which I believe would have been the envy of many Victorian ladies who had to settle for artificially constructed wire or wooden ones, which I imagine must have proved very tricky to sit upon! Thankfully, mine has none of these design flaws). 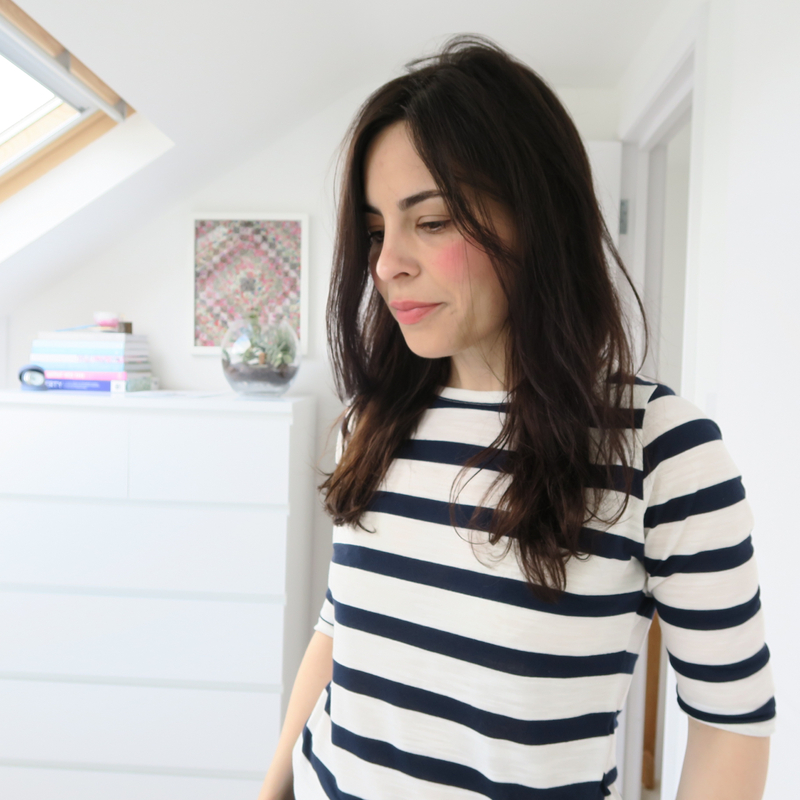 It's so comfortable that I can see myself happily pulling on one of these tops a lot - although not in a comfy pair of pyjamas way, but just in terms of it feeling full of details that I love and very wearable. 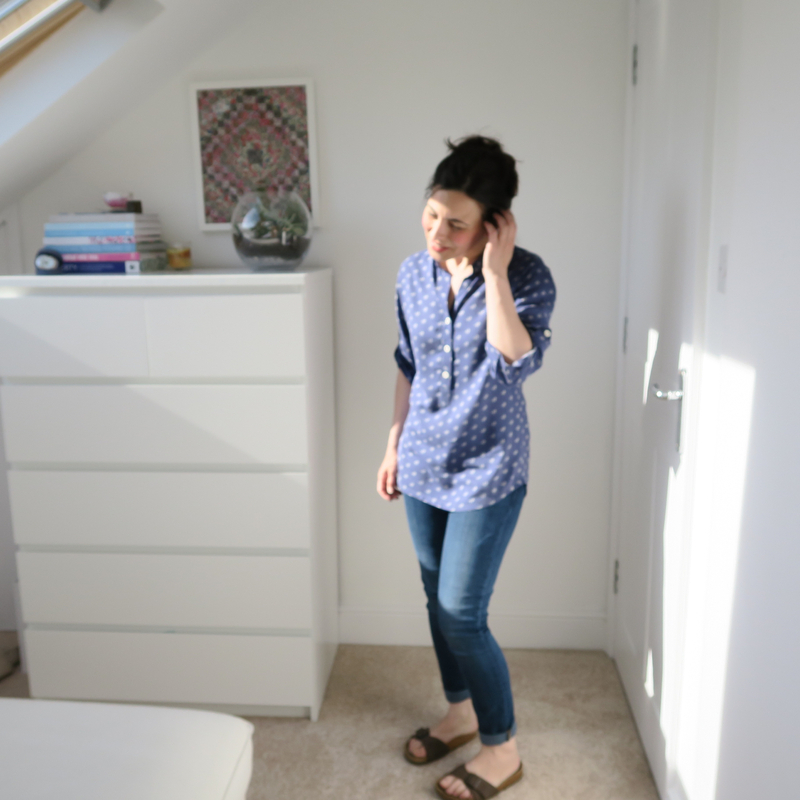 I recently read about a woman who has taken to wearing a self-imposed work uniform to simplify the process of getting ready each day. 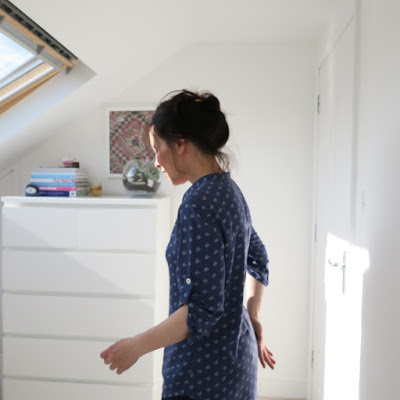 Her story resonated with me: I love clothes (in the obsessive, heart-racy way of loving them), but equally I also don't want to spend much time getting ready in the morning. 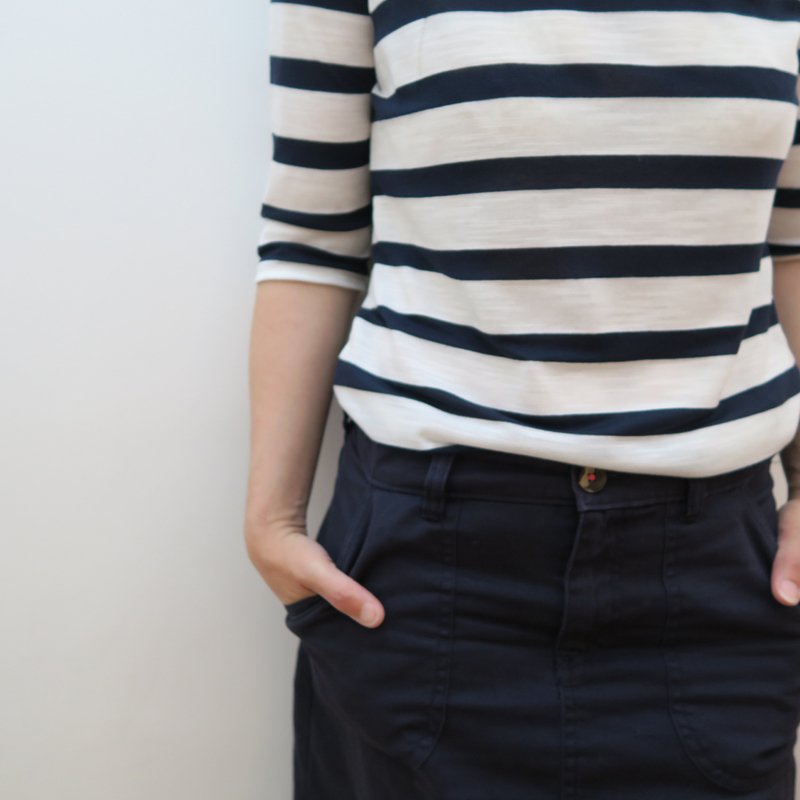 I realised that over the winter, I'd naturally taken to wearing an unofficial uniform myself: I don't think I wore anything other than skinny black jeans from September to April this year. They felt perfect for everything from dog walks to going out in the evening and all I needed to do was to pick out a jumper from my limited colour palette of navy or grey options, which meant that dressing took less than two minutes each day. The uniform of black jeans were all Baxter jeans from Topshop bought up over the last three or four years (sadly, now discontinued and reincarnated under the same name, but in a completely inferior and unwearable form, which makes me wonder why they've called them the same thing), which I dyed black every few months to make up for the constant washing, as while I've never been someone who feels the need to wash jeans every two or three days, sadly Nell hasn't yet learnt the art of not splattering mud over her walker during a wet winter, so frequent jean-washing was a necessity. 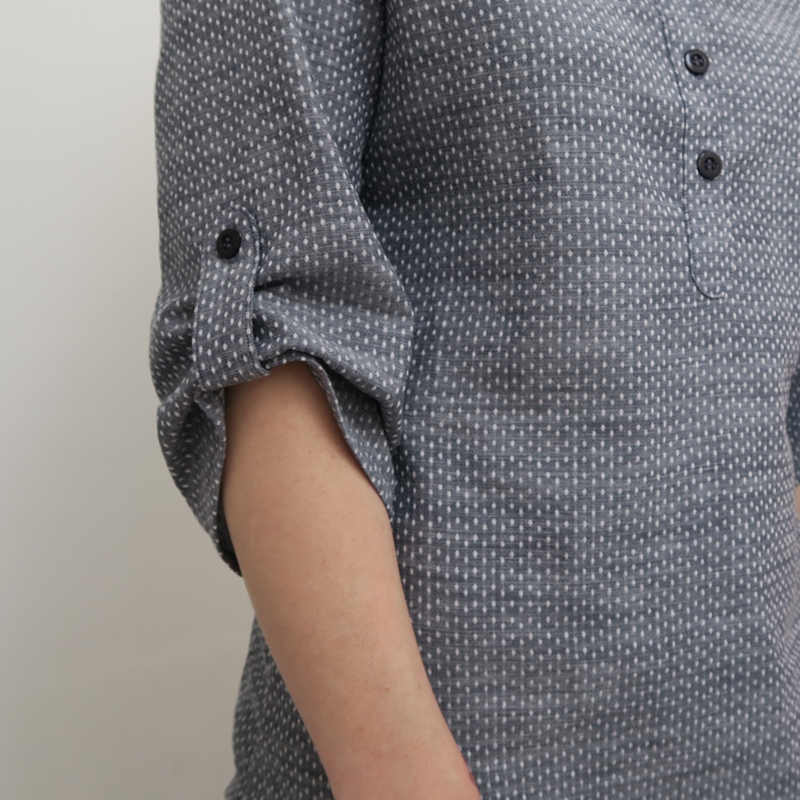 This shirt has five button holes and I was pleased to discover that my machine (I think I've had it since January, but I've only started trialling its perfection as a dressmaking companion more recently.) makes them beautifully with very little input from me! I'll have to tell you all about my machine in another post as I truly love it and would definitely recommend it. Right, I think that's everything. Do tell me about your own uniform if you have one. 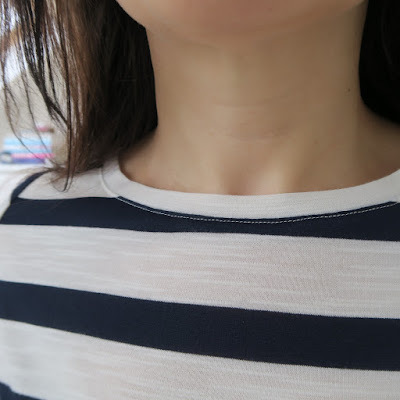 Over the weekend, I drafted a top and, with no pattern or sewing instructions, was left pondering how long the neck band should be and exactly how I should install it. 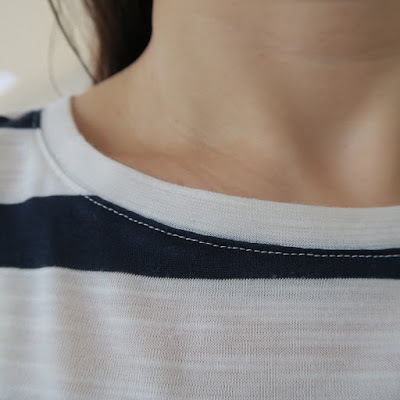 I've sewn on neck bands in tops that have a central opening before, but never a loop neckband on a boatneck t-shirt. But freakily, this turned out perfectly, so I thought I might write up what I did (sorry, no step photos as I only thought to tutorialise this afterwards). Sew the shoulder seams together. Lay the top out flat with the neckline sitting as smoothly as possible. 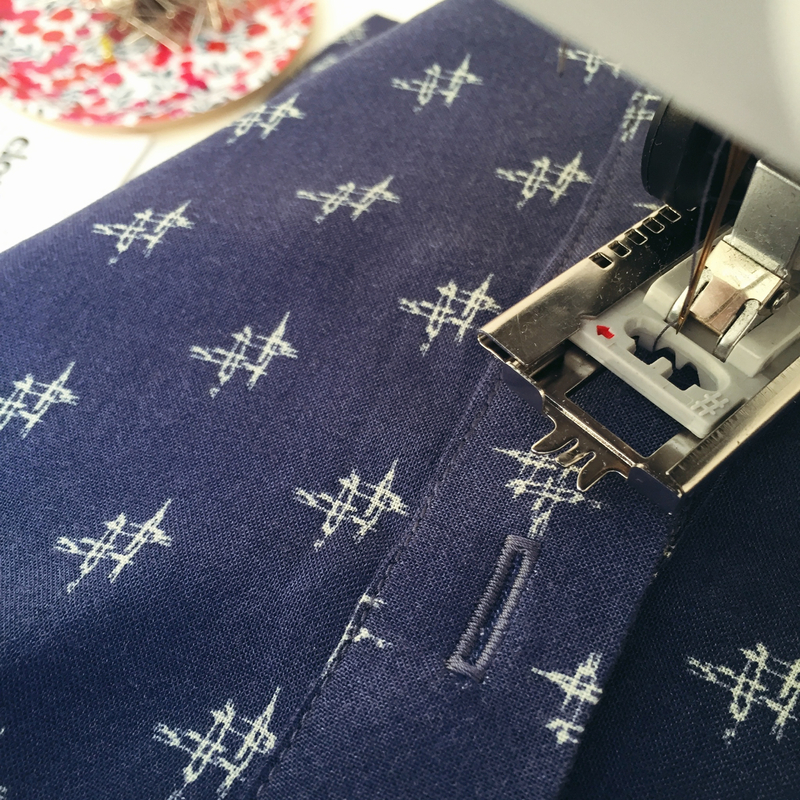 Using a soft tape measure standing up on its side, measure around the neck (on the fabric, rather than the paper pattern pieces as jersey can stretch or slip around a bit while cutting), being careful not to stretch the jersey as you do to avoid getting an inaccurate measurement. Mine was 22" Cut the fabric for the neckband an inch smaller than this measurement so that it can stretch to fit perfectly with no neck gape, so mine was cut at 21". I didn't actually add any seam allowance on as my material is really stretchy and I was only using a small seam allowance, so in reality, my band was 1.5" smaller than my top's neck. You may want to adapt this to your own preferences. To get the width of the band, decide how wide you want the finished neckband to be - mine is 3/8". Then decide how much of a seam allowance you want - again, mine is 3/8". Add these two figures together. That gives me 6/8". Now double this measurement (as your neckband has two sides to it). This means my neckband needed to be cut 1.5" wide x 22". Lay the fabric down and see which direction has the most stretch. Cut the neckband along the maximos stretchios direction of the fabric. 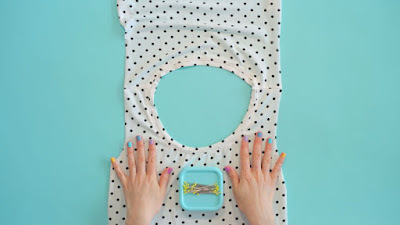 Fold the band in half along the length, wrong sides together, and press with an iron. 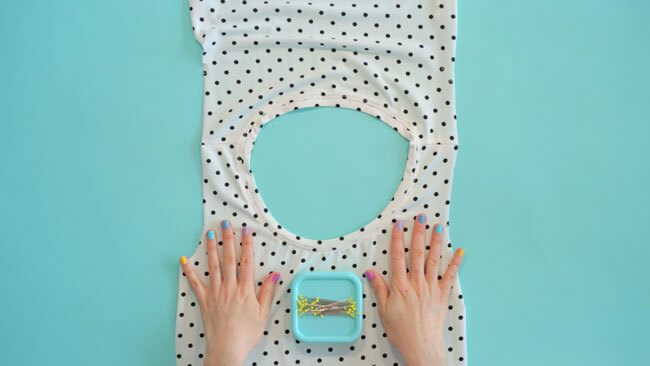 Always use a ball-point needle for sewing knits. 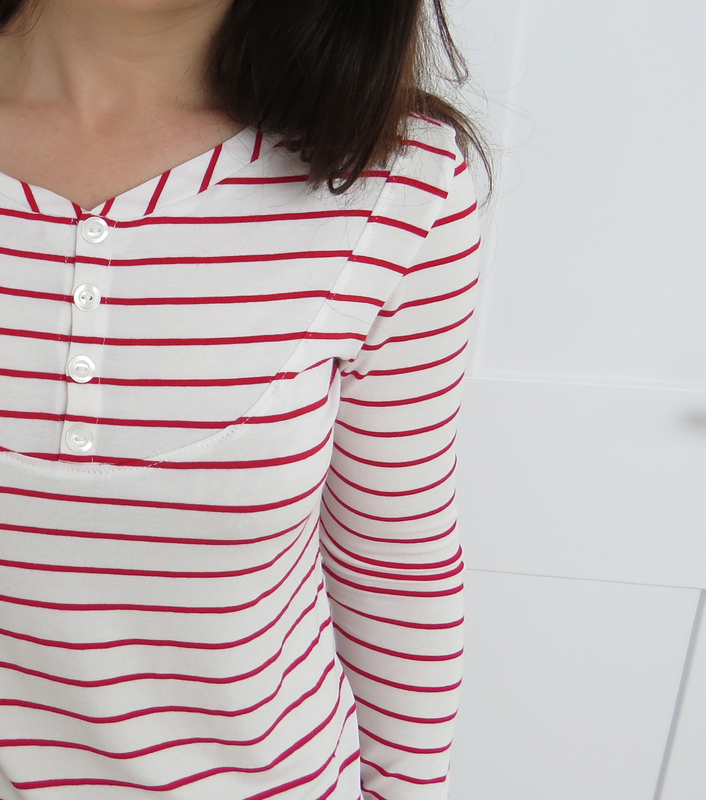 With right sides together, sew the two short ends of the neckband together to make a loop. On the neck line of my top, I marked the centre front and centre back and both sides to get four perfectly even quarters. The sides aren't necessarily in line with the shoulder seam, as the back and front pieces won't always have a neck that measures an identical length on these two halves - worth keeping in mind as the four quarters need to be even. On my loop, I marked the centre (directly opposite the join) and then placed the centre and join together, to find out where to make the other two marks to give four even quarters. Next, placing fabrics right side to right side and aligning raw edges, pin the join on the loop to the centre back of the top, and then pin, lining up markings at the other three points. Now stretch the neck band perfectly evenly between the four points and pin in place. I used an overlocker to sew the band to the top, but a sewing machine with a stretch stitch or zig-zag stitch would be fine. I then pressed the seam allowance toward the top (away from the neck band) and understitched it in place to avoid it flipping up. This is the line of stitches you can see just beneath my neckband. 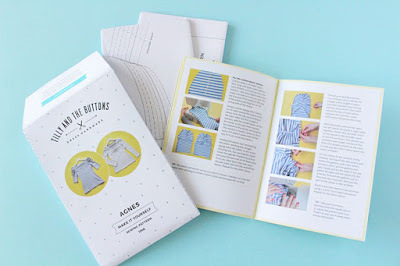 Optional: sew a band of self-fabric or ribbon across the inside back of the neck to cover the join in the neck band on the inside of the garment. I used Prym Wonder Tape to temporarily stick my other seams together before sewing the rest of the top (it washes away afterwards). This stabilises the knit fabric, dispenses with the need for pins and stops hems from resembling the wavy edge of a lettuce leaf. It's amazing stuff. I only discovered it last year when someone on Instagram mentioned it to me and it's revolutionised things for me! The slub jersey fabric is all kinds of amazing. It's really fine, very drapey, but somehow not completely unstable. It looks like it's going to be outrageously transparent when it's just a piece of fabric, but once it's sewn together, it doesn't look that way at all (although it's definitely not bottom-weight fabric). This top cost me just £7.50 to make. Or it would have done if I hadn't won a £25 gift voucher to spend at The Village Haberdashery and spent part of it on this fabric! If you tag anything you make with #tvhhaul on Instagram, you'll automatically be entered into a drawer each month. I'd completely forgotten I'd done this, so when Annie emailed me with my voucher there was much joyful spending and no dignified saving; my fabric arrived the next day. Finally, I think I stumbled across Abby Glassenberg's blog, While She Naps, a few years ago and ever since have admired Abby's well-researched posts that cover everything from how much fabric designers get paid (and how poorly many are treated in terms of funding quilt market), how craft book publishers are diversifying and possibly upsetting their authors in the process, or discussing the way gender often seems to define how a sewists work is perceived in our industry. Abby has a knack of turning ideas that only rumble at the peripheries of my thinking, and delivering them as fully-formed observations that drop, crystallised, into my lap, giving substance to something that I later recognise as having made me feel a certain way, but which hadn't progressed to being thought through at any deeper level. In short, I really love her fearless blogging voice; she tackles the things that others in our industry shy away from talking about and has a refreshingly direct approach. So, being something of a fangirl, I'm delighted to be featured in Abby's (less controversial!) 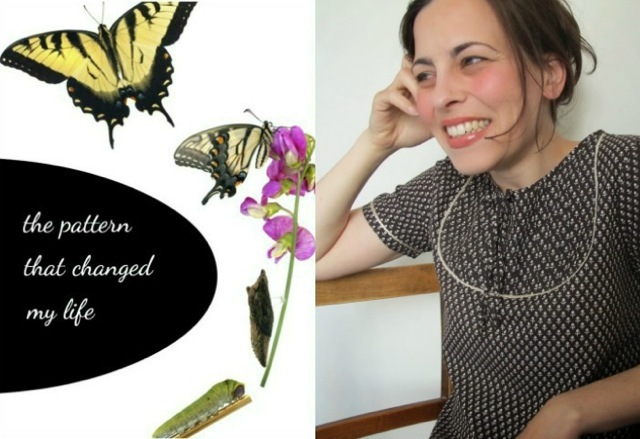 'The Pattern that Changed My Life' series, where she asks people about a pattern that's been pivotal in their journey as a sewist. I didn't even have to think twice about my choice, although I could easily have picked one related to dressmaking and one to quilting as they feel such different disciplines. Do go over and read if you have a few minutes to spare.